Revenue Share Affiliate Forex program "Revenue Share"
CPS Affiliate Forex program "CPS"
Contest for Forex video bloggers You’d like to be a video blogger but don’t know what to start with, right? Start with LiteForex! Earn 100$! Oil continues to strengthen and is currently trading near 4-year highs. The main catalyst for the growth of the market is US sanctions against Iran. November 4, anti-Iran sanctions will come into effect, which will create a supply shortage of 1.5 million barrels per day in the market. OPEC and its allies reported a shortage of capacity to increase production. The format of OPEC+ is advantageous for the shortage of proposals on the market for high oil prices consolidation. In addition, today, US Energy Secretary Rick Perry rejected the possibility of using strategic reserves to compensate for the Iranian market share. Thus, the energy carrier has a high potential for growth, but market participants are concerned by a possible increase in production in Saudi Arabia by 0.55 million barrels per day. Baker Hughes US Oil Rig Count release is due today at 19:00 (GMT+2). If the number of rigs exceeds 866 units, then oil will step off from local highs, reversing downwards. On the 4-hour chart, the instrument tests the upper border of Bollinger bands, which is the key resistance level. The indicator is directed horizontally, and the price range is narrowed, indicating the correction of the uptrend. MACD histogram is in the positive area, keeping a buy signal. 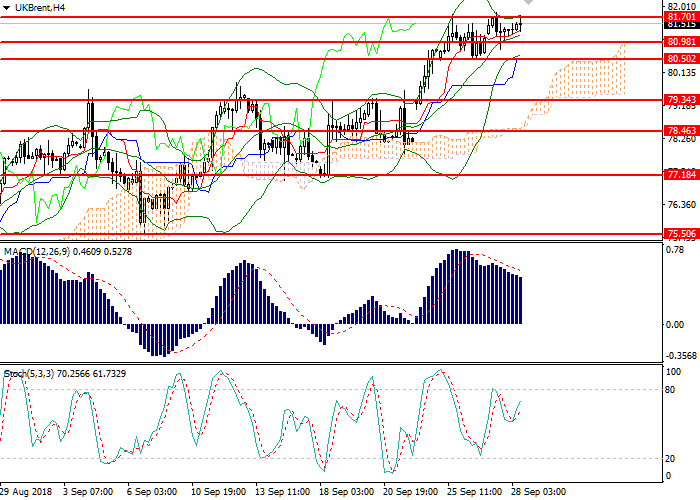 Stochastic is approaching the overbought area, there is no signal for entering the market. Support levels: 80.98, 79.34, 78.46, 77.18, 75.50. Long positions can be opened from the current level with the target at 82.35 and stop loss 80.90. Implementation period: 1–2 days. Short positions can be opened below 81.10 with the target at 79.50 and stop loss 81.65. Implementation period: 2–4 days. The material published on this page is produced by the Claws&Horns Company and should not be considered as the provision of investment advice for the purposes of Directive 2004/39/EC; furthermore it has not been prepared in accordance with legal requirements designed to promote the independence of investment research and is not subject to any prohibition on dealing ahead of the dissemination of investment research. Cannot read us every day? Get the most popular posts to your email. Get access to the exclusive materials and additional analytical tools by Claws & Horns. - experts' opinions and training materials. Follow us in social networks! Risk Warning: Trading on financial markets carries risks. Contracts for Difference (‘CFDs’) are complex financial products that are traded on margin. Trading CFDs carries a high level of risk since leverage can work both to your advantage and disadvantage. As a result, CFDs may not be suitable for all investors because you may lose all your invested capital. You should not risk more than you are prepared to lose. Before deciding to trade, you need to ensure that you understand the risks involved and taking into account your investment objectives and level of experience. Click here for our full Risk Disclosure. The website is owned by LiteForex Investments Limited. Liteforex Investments Limited does not provide service to residents of the EEA countries, USA, Israel, and Japan.